Your big news deserves an event to match. Corinthian Events will create an opening or launch that heralds the news with flair. We'll turn your construction zone into an elegant affair, or plan a launch to introduce your product into the marketplace in style. With Corinthian Events, your product is the star! "One of my favorite parts about working with Corinthian Events is witnessing their creativity on site visits and preproduction meetings, where anything is possible and we just have to figure out how to make it happen!" Promoting Lucky Brand with a performance by Tim Gunn at the Burlington Mall. Ever plan an event with TSA security Rules? Well, it has some challenges! We had to follow all of the same rules that apply to travelers. 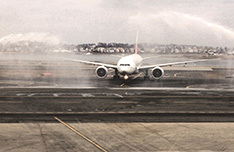 This meant no water, our floral arrangements which had to be brought in dry and filled in the terminal! That was just the start. 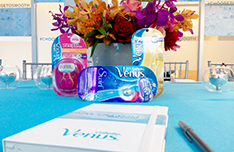 Transforming a Gillette Venus conference room into a branded showroom takes smooth delivery and razor sharp execution.